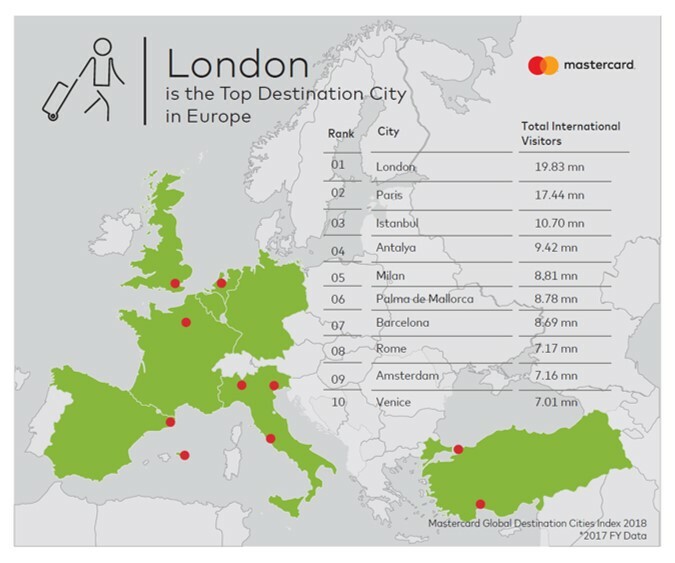 LONDON – September 25, 2018 – For the past decade, Mastercard’s Global Destination Cities Index has offered important analysis of travel to and within cities. This year’s top cities are Bangkok, London and Paris, once again underscoring the importance of robust infrastructure, both business and leisure attractions and strong local culture. The numbers make hugely positive reading for London, which sees continued growth in visitor numbers, and the amount they spend. With 19.83 million international overnight visitors, London retains second place this year. Visitors tend to stay in the city for 5.8 nights and spend £117 per day, on average. London continues to dominate Europe in shopping expenditure by international visitors. People spend more money in London than any other European city, representing 49% of visitors’ expenditure. International visitors spent £13.33 billion in London in 2017, an increase of 8.5% from the previous year. This was £3.4 billion more than visitors spent in Paris. The Mastercard Index, which expanded this year to look at 162 cities globally, is not simply a ranking of the top travel destinations. Based on visitor volume and spend for the 2017 calendar year, the in-depth analysis also provides a growth forecast for 2018 and —for the first time — a view into average length of stay and amount spent per day. The annual growth of international overnight visitors to the Top 10 destination cities was up in 2017 except for Seoul, which saw a dip. The forecast for 2018 indicates across the board growth, with Istanbul expecting the largest uptick in visitors. London has enjoyed years of continued growth in international visitors. In 2013, the capital attracted 16.81 million people from overseas. That number has since swelled by more than 3 million. Dubai continues to be the global leader in overnight visitor spend, with visitors spending a whopping £410 per day on average. It is joined in the Top 10 with newcomers Makkah in Saudi Arabia, which debuts in the number two spot, Palma de Mallorca and Phuket. Identify and address urban challengesthrough scalable solutions in digital inclusion and economic development; Mastercard recently launched City Possible, a global platform for cities, research institutions and private sector organisations to address common challenges through collaboration. Simplify access to key urban services such as public transportation; in over 100 cities (and growing), visitors and locals can use the contactless Mastercard they already carry to access trains and buses. Help people traverse the globe with peace of mind: seamless planning, conveniences and connectivity at their destination and worry-free acceptance at millions of locations around the globe. Create unique experiences across food, entertainment and shopping in 42 Priceless Cities around the globe, including London.